Harry M. Martin, no date. Courtesy of Robert Donnelly and used with his permission. Harry Martin? Oh, I was a little boy at the time. I remember, I have a vision of him. He was heavyset, had red hair, a red moustache, but he was very much of a go-getter and businessman. George Winchester Stone, Jr., whose family moved to Cummings Lane in Martin’s Third Addition in 1909. Harry Martin played a key role in the suburbanization of Montgomery County, and the development of his “Additions to Chevy Chase” were part of the changes that transformed a small farm lane into the modern residential street called Cummings Lane. Harry M. Martin was born in Washington, DC in 1865. He was one of eight children born to James Martin, a bookbinder, and his wife, Helen Marian Simpson. The Martin family moved from the District of Columbia to Kensington, Maryland sometime after the 1880s. Harry Martin lived in Montgomery County for most of his life, including several years at his new home on Cummings Lane. In his final years, he lived at a nursing home in Washington, DC. By marketing his new suburban subdivisions as “additions” to Chevy Chase, Martin took advantage of all the amenities and name recognition the Chevy Chase Land Company had created since the 1890s. Harry Martin’s house at 401 Cummings Lane (now 3517 Cummings Lane). In 1908, Martin sold the house to William Orme and his wife Amelia Stahl Orme. CCHS 2008.202.04. Martin also built a large house for himself on Cummings Lane, or Cedar Avenue as he named it on the subdivision plat for Martin’s Third Addition. As a new resident of his subdivision, he became involved with the local community. For example, members of a newly formed Presbyterian congregation met at his home in 1906. The following year, Martin helped them buy a lot for their church at Connecticut Avenue and Chevy Chase Parkway. His connection to the Presbyterian Church was strong, and he would later be one of the founders of the Warner Memorial Presbyterian Church in Kensington, MD. 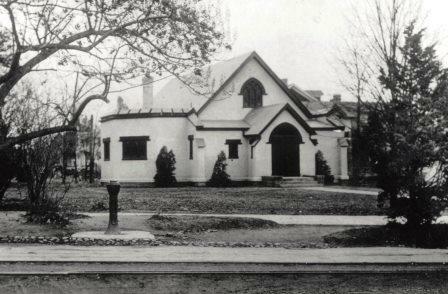 The original Chevy Chase Presbyterian Church, constructed in 1910. From a slide lent by Robert A. Truax and Lee Rogers. CCHS 2007.33.09. In 1908, however, he sold his house in Martin’s Additions to the William Orme family, and he moved back to Kensington. He developed Chevy Chase View, which later became part of Kensington, as well as new subdivisions in Germantown and along Norbeck Road. He was well-known to others in his field, and frequently consulted for his “keen sense of real estate values,” according to his grand nephew, Robert Donnelly. Harry was thoroughly involved in civic affairs. He was the prime organizer of the Chevy Chase View Special Taxing District. 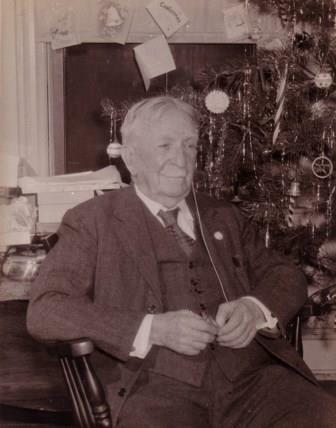 After having served ad interim as a committeeman, Harry was elected the first Chairman of the Citizens Committee in 1925, and served the Committee until 1938. His public spirit was such that in one case he signed a petition against the establishment of smaller lot sizes despite the fact that such a change would have been to his financial advantage. In one history of Montgomery County, Harry is noted for “leading” Kensington residents in a demand for a high school in their community. Harry never married but took custody of his two nephews, Lawrence and George Smoot and oversaw their growing up. He provided a home at various times to members of his family including his sister, Katie, and her husband, Lars Erickson and, later, to his niece, Evelyn, and her children when they were between travels to be with her husband during WWII. Interestingly, Harry never learned to drive. He depended heavily on associates, friends and neighbors for transportation. He could often be seen at Connecticut Avenue and Dresden Street where he would hail down cars, get in and ask to be taken on his way! He was hard of hearing and very deliberately would turn off his hearing aid if a discussion was not proceeding to his liking. In many respects, Harry Martin was larger than life. Harry M. Martin was my great uncle. I remember him as the patriarch of the family and, for me, a rather fearsome old gentleman. He was, however, putty in my mother’s hands. 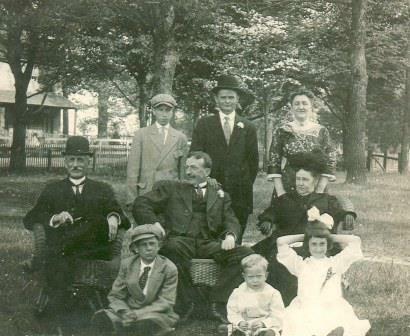 Harry M. Martin, center, with members of his family, no date. Courtesy of Robert Donnelly and used with his permission. Mr. Farr remembered that Martin was very upset about the Chevy Chase Lake dance pavilion in the 1930s. After Prohibition was repealed in 1933, the managers of the amusement park began serving beer, and Mr. Martin was very concerned that young people were drinking. So Mr. Martin said, “All those young people. No beer, no beer.” And he really raised some smoke about it. In addition to his real estate and civic concerns in Montgomery County, Harry Martin was active in Maryland politics. He also worked for Woodrow Wilson and Franklin Delano Roosevelt during their presidential campaigns. Under Wilson, he was appointed first assistant to the fuel administrator. By the time of his death in 1956 at age 90, Harry Martin’s work as a developer set the stage for the postwar suburbanization of Montgomery County. In the rest of this section, we focus on his Third Addition to Chevy Chase – one of his first subdivisions, and the one that transformed Cummings Lane from a small country lane to a modern suburban street lined with single family homes. Lot No. 1, on this 1885 C. J. Maddox Jr. survey of the John Hopkins Anderson estate, was purchased by Harry Martin in 1905 and became Martin’s Third Addition. From court records relating to the No Gain estate, and reproduced here from William M. Leogrande, “’No Gain:’ Portrait of a Family Farm, The Montgomery County Story, Vol. 42, No. 2 (May 1999). 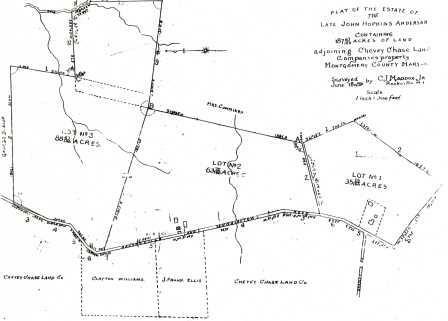 Cummings Lane was on the northern boundary of Harry Martin’s “Third Addition to Chevy Chase,” a tract of 35 ¼ acres which Martin purchased from Henry Griffith on August 26, 1905. Mr. Griffith was one of the heirs of the remaining property from the “No Gain” plantation. Formerly owned by John Hopkins Anderson, it had once been as large as 300 acres. Griffith and his wife, Isabella, also a “No Gain” heir, sold a few lots on the east side of Brookville road. Although some of the Anderson estate property was sold to the Chevy Chase Land Company (areas which are today known as Section 3 and Section 5), Lots No. 1 and 2, as shown in the land survey map below were sold to Harry Martin. Cummings Lane was the northern boundary of Martin’s Third Addition, and ran between Martin’s 1st and 3rd Additions. The lane was well known as the access road to the Cummings Farm. Apparently inspired the cedar trees that lined both sides, Martin decided to name it Cedar Avenue when he made the subdivision plat. This was a developer’s privilege, and Martin named another street in his Third Addition after himself – Martin Street is now known as Raymond Street. But local residents never adopted the name, and eventually the name reverted back to Cummings Lane. 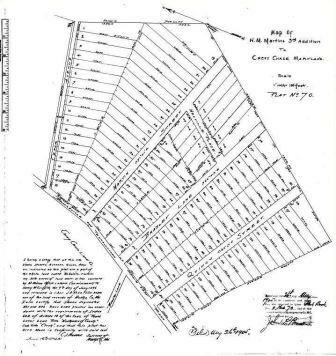 1905 plat map for Martin’s 3rd Addition. Cummings Lane was renamed Cedar Avenue by Harry Martin, after the cedars planted along the road, but the name didn’t last long. Within ten years, the official street name became Cummings Lane. 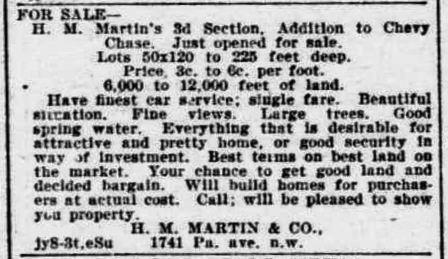 Harry Martin offered lots in his new subdivision at significantly lower prices than those for sale by Chevy Chase Land Company. Deeds from the period show that Martin required the construction costs for new homes to be at least $1,750. By contrast, the Chevy Chase Land Company required houses on Connecticut Avenue to have a minimum construction cost of $5,000, and those built on side streets, $3,000. Martin worked with several local builders, including Horace Troth, Albert N. Prentiss, and John Reid. The neighborhood attracted middle-class federal employees, as it offered quality housing close to Washington, D.C.
Have finest car service; single fare. Everything that is desirable for attractive and pretty home, or good security in way of investment. Best terms on best land on the market. Your chance to get good land and decided bargain. Will build homes for purchasers at actual cost. The Evening Star, July 11, 1904, p 13. The street car line was at the top of the list, and with good reason. Few government workers owned automobiles at the turn of the century, so new residents would need public transportation. Taking advantage of the already existing streetcar line on Connecticut Avenue, Martin was able to claim that his lots had easy access to the trolley line. In practice, however, it was not so easy to get from the new homes on Cummings Lane to the streetcar on Connecticut Avenue. In the early days, residents had to walk across fields, along paths that were often muddy. 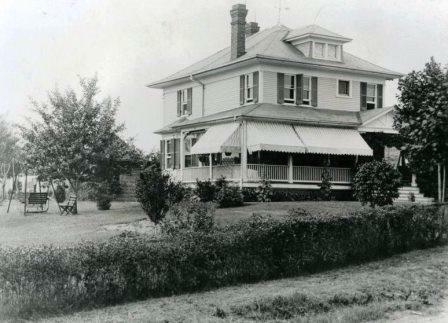 In 1906, residents of the area formed the Chevy Chase Home Association and at a cost of $14 for lumber, $2 for stone, and the donation of their own labor, they built a 350-foot path across the fields. It was one board wide. On winter work days, commuters from Harry Martin’s Additions hid their lanterns in the bushes near the trolley tracks on Connecticut, so they could follow the wooden pathway home in the dark hours at the end of the day. These are just a few of the early residents of Martin's Additions who worked for the Federal Goverment -- and made the daily commute via the Connecticut Avenue streetcar. That the property hereby conveyed, either before or after the improvements are made, cannot be sold, rented, leased or otherwise placed in the possession of a colored man or one of the African race. This restriction did not appear on any subsequent deeds for this particular home, but such restrictions or covenants in property deeds were not uncommon in the early to mid-twentieth century in the United States. It was not until 1948 that they were made illegal by the U.S. Supreme Court’s decision in the case Shelley v. Kraemer. Despite the ruling of the highest court, racially restricted covenants would continue to appear in property deeds for years; their legacy shaped the patterns of racial and ethnic segregation in residential neighborhoods across the nation. Mr. Martin’s Third Addition, along his other three additions, were recognized as Martin’s Additions to Chevy Chase by the State of Maryland as a special taxing district in 1916, and in 1985, Martin’s Additions was incorporated as a municipality. Click NEXT to read about some of the first residents of Martin’s new development along Cummings Lane: the William Orme family, who bought Martin’s home in 1908; the George Winchester Stone family, who moved to their home at 3517 Cummings Lane in 1909; and the Ray Palmer Teele family, who purchased land for their new home in 1906.